The stage is illuminated only by soft ambient lighting. As people take their seats, accompanied by the howl of a fierce northern wind over the speakers, they all take a glance at the assorted parts of the set - a covering spread out, on which lays a stool, a bag, a pipe, a blanket and, more tellingly, a ladder and sled. It darkens, the wind sound falls with the murmur of the audience as a character comes into view carrying a lantern. He sits on the stool and leans over to grab his pipe. He sits, surveys the audience and in a broad Kerry accent greets us with "God fare you, you're looking well". Tom Crean, Antarctic Explorer is on stage. 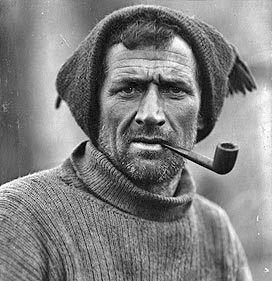 Tom Crean (1877 – 1938) the intrepid Antarctic explorer and for a long time one of Ireland’s unsung heroes served with both Scott and Shackleton and survived three famous expeditions: Discovery, (1901 – 1904); Terra Nova (1910 – 1913); and Endurance (1914 - 1916). Despite adventures including an amazing 36 mile, solitary rescue trek to base camp during one expedition, described by Antarctic historians as “the finest feat of individual heroism from the entire age of exploration”, Crean returned to his native Kerry an extremely modest man. There is no evidence of Crean giving any interviews to the press. Wikipedia says this may have been "because Kerry had long been a centre for Irish nationalism, and it would have been inappropriate for an Irishman to speak of his achievements on British polar expeditions." "Sure it's my own fault. I never kept a diary. No diary, no record. Sure haven't I more things to be doing at 30 degrees under than keeping a fecking diary?" Aidan Dooley thinks it's a mixture of the two, and this one man play, written and performed by him articulates this. While the written word was important - indeed that's how Shackleton and Scott both remained in people's memories, through memoirs and articles - Aidan thinks Crean may have been content to stay below the notice of both authorities and "rebels" and instead regale the town's children with tales of his exploits. Sitting in the theatre, that's exactly where I feel I am. Sitting in a circle at the feet of this man in Co Kerry as he brings me and everyone around me with him through the Antarctic, from leaving his father's farm and lying about his age to get into the Navy to returning home to his wife some 25 years later. It is an epic journey over mountains of ice, traversing miles of harsh Antarctic terrain, across 800 miles of the South Atlantic in a 21 foot lifeboat and the rescue of comrades and we are there every step of the way, brought by one man and his words. These words evoke strong images, the story telling technique one that is conspicuously absent ordinarily in bringing history to life. This is more than a story about some historical figure. Tom Crean becomes a person you'd want to know. I sat with Aidan after his show's recent run in the Olympia Theatre to learn a bit more. "The show evolves every time I do it. I don't have this script written down - I'll try it differently all the time. Small things, something unique - a different line or phrase. I'll see how the audience reacts - sometimes it works, sometimes it doesn't. If it doesn't work, it comes out." So our conversation begins. We're in Maureen's bar, surrounded by pictures of the many celebrities and personalities who have been through these doors and as Aidan relaxes after the last night of a successful run, he shares his own story with me. Aidan is from Galway. He trained at the Guilford School of Acting and works as a freelance actor, writer and director in London. He lives in Rochester with his wife Miriam and two children Liam and Nancy. 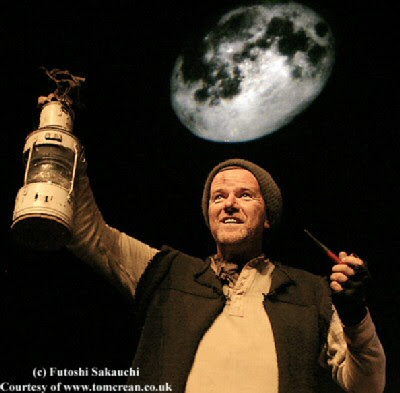 The show originated from a fifteen minute Living History performance on Tom Crean created for London’s National Maritime Museum’s Antarctic Exhibition ‘South’ in 2001. 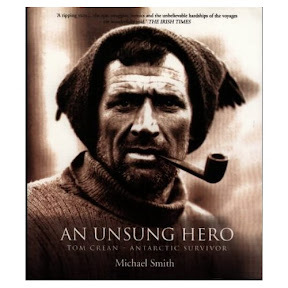 Following the publication of the book ‘Unsung Hero’ by Michael Smith the show was developed over a two year period with several small tryout performances in Ireland, including a performance in front of Crean’s remaining family at the Tom Crean Society’s memorial in Annascaul. "No two shows are the same. As I said, each show has different lines. No ad lib works the second time. It's about working things into each performance. When I walk out on stage it becomes an imaginary place and I walk into that. The experience depends totally on the performance area and the people I'm performing to. There are different reactions and experiences all the time." I've never been. I don't read about it any more. The more I read about it, the more I want to put into the show. As the show has evolved I've realised it's more about what you take out than you put in. Choosing the lines, the stories, the phrases is all part of it. How the audience reacts - it all dictates how Tom will be portrayed. It's really his story and I feel privileged to be the one telling it. "He was a fascinating character - both in how he was on the journeys and how he behaved when he came home. I imagine him happy just talking to the local children, showing them the bits of equipment, describing the adventures. That's how I tell the tale. It's not a set piece of drama, it's a gather around story." Indeed that seems to play out during the play as he addresses the audience at times saying "Are ye out there at all. Is there anyone there?" The audience are an important part of the production as it's their reaction that dictates the mood, tone and progression of the story. "The one that springs to mind is Castlebar, Mayo a couple of years ago. 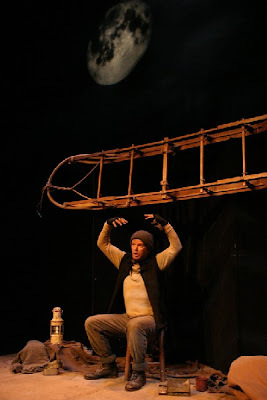 There's a part in the play where Tom is calling down a glacier crevasse to gauge its depth - it's a long call of "Helllloooooooooo" and from the audience came the echo "Hellloooooooooooo". I was laughing so much with the audience I had to stop the performance, turn and tell them of all the places I'd been, this was the first time that had ever happened." 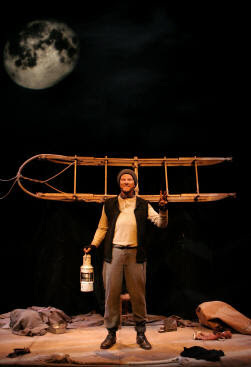 The play premiered in August 2003 at the New York International Fringe Festival. Between 2004 and 2006 the show toured across Ireland and the USA including a Fringe First Award at the 2006 Edinburgh Fringe First Festival. It's also been to Adelaide, Florida, Malta, Dubai, New York, Geneva, and London's West End this year where it was awarded the Time Out Critics Choice. It's been in Dublin's Olympia and is now coming to the Gaiety Theatre. If it hadn't been for plays like this, the story of this gentle courageous man would never have reached as many audiences. There's no hyperbole, no dramatics - the story follows its own truth and affects the audience in a way personal to each and every person there. We finish our chat discussing his involvement with the Play On Words theatre group in the UK, of which he's a director and founding member. Bringing Shakespeare to schools and summer camps, Aidan delights in this fifteen year old group making the plays accessible to young people. It has also diversified to incorporate performances on science and history, with Tudor, Victorian and WW2 shows for primary school students. Aidan also has a new blog on his his website. He'd really like it if you went over to say hello. Find out more on Tom Crean on the official website here. 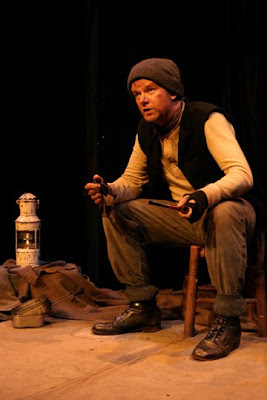 Tom Crean: Antarctic Explorer is running in Dublin's Gaiety Theatre from Thursday 12 to Saturday 21 June. Tickets start at €21 and are available from Ticketmaster. I saw this in the Civic Theatre in Tallaght and loved it. What really comes across his the extremes of their situation and the steely sense of self-preservation. It made me want to know more about Crean and I picked up a couple of books about him. I saw the show the last time it was on. It was a damn fine job. I knew most of the stories already from reading about Shackelton and Crean, but it was well told and created a good atmosphere. @Sinéad - hello and welcome :) Thanks for the comment. the story is pretty amazing alright. The extremes seem unimaginable in this day and age but I guess that's what people had to go through. Did the same for me re the books. Unsung Hero though was definitely the best so far. @thriftcriminal - welcome sir. I have to confess that while i knew the names of Shackleton and Scott I hadn't known about Crean. There were different documentaries on but it wasn't until this play that the full scale of the adventure and bravery became apparent and his heroism was really shown. "To die is the easy thing; to struggle to live is what true heroism is all about"